"...and they come back to me!" In our recent Point of Articulation column, "An Open Letter to Art Asylum," we said that when making figures from a movie or television series, the toy company must deal with some simple facts: there are popular characters, there are secondary characters, and then there are all the rest. There are characters who will appeal to everyone, there are characters who will appeal to dedicated fans and there are characters who will appeal only to die-hard completists. There are several ways to deal with this inherent limitation, but the best seems to be what Palisades is doing with their Muppet Show figures. They could have put all the main Muppets in the first series: Kermit, Fozzie, Gonzo and their best friends could have easily been shipped in one or two series. Instead, Palisades is playing it smart; they're playing the variation game, but they're doing it early. The first Gonzo they produced was in his "Gonzo the Great" costume; the second one, in a later series, will be in his normal suit and come with Camilla, his favorite chicken. By spreading out the standard versions of the main characters, they're giving their line legs. Lew Zealand is a perfect example of how varying the line-up works. Lew is a minor character who most folks don't even remember, let alone identify with. His act on the show consisted of his boomerang fish: he throws them, they come back. Simple gag. Simple character. Not tremendously famous by any means. If Lew was a Simpsons character, we would have seen him in Series 18 or so. No one remembers the poor misbegotten lump of felt. No one but Palisades, who gave him to fans in Series 3. 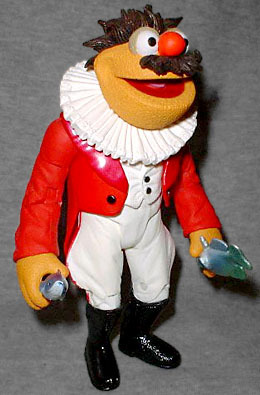 Dressed in a ringmaster's uniform (red coat, poofy white pants, button-up vest and an Elizabethan collar), Lew stands 5¼" tall. He moves at the neck, shoulders, biceps, elbows, wrists, waist, hips and knees. Lew is ostensibly a human, in that he's not a bird or a dog. He's got a great big smile on his orange face, and his hair, wild stands of fur on the real puppet, is sculpted into great spikes all over the top of his head. 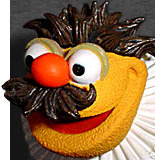 His mustache flares out from under his bulbous umber nose and his eyelids are a muted tan. Palisades needs to have a talk with its quality control department about Lew's production values: the white of his pants and vest are sloppily applied, with obvious brush strokes over the touched-up areas; the paint from his shiny black boots seems to have gotten on everything, but the same color is applied poorly on the buttons. His arms were molded from white plastic, and the red paint on them scrapes off quickly. Lew had to spend hours in the freezer before all his joints would move. It's really rather disappointing. 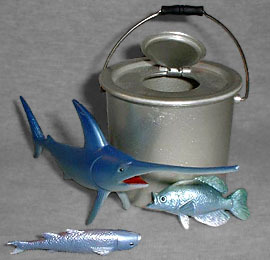 Lew comes with a fish bucket and three of his amazing fish. The bucket has a moving handle and an opening cap in its lid. He can hold the fish (with some finagling), but you'll have to throw them - and get them to come back to you - on your own. Palisades Toys usually gives us great toys in their Muppets line, but Lew must have slipped through the cracks. Let's hope that he's just an anomaly, and not a sign of things to come.